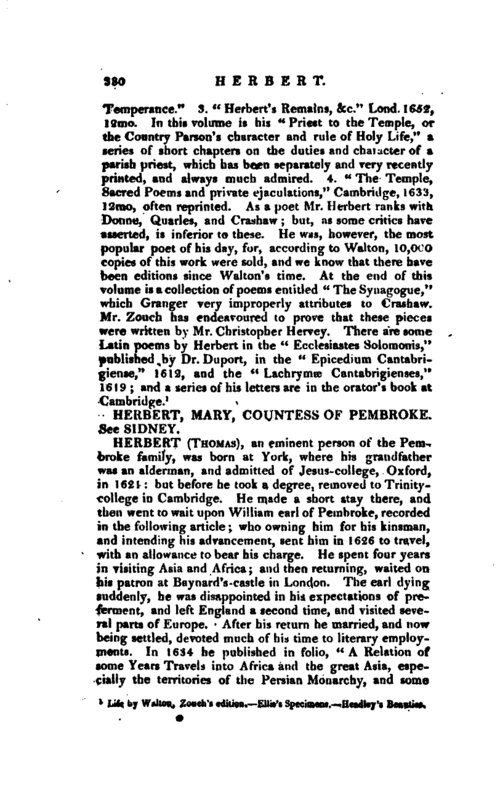 , an eminent person of the Pembroke family, was born at York, where his grandfather was an alderman, and admitted of Jesus-college, Oxford, in 1621: but before he took a degree, removed to Trinitycollege in Cambridge. He made a short stay there, and then went to wait upon William earl of Pembroke, recorded in the following article; who owning him for his kinsman, and intending his advancement, sent him in 1626 to travel, with an allowance to bear his charge. He spent four years in visiting Asia and Africa; and then returning, waited on his patron at Baynard’s-castle in London. The earl dying suddenly, he was disappointed in his expectations of preferment, and left England a second time, and visited several parts of Europe. After his return he married, and now being settled, devoted much of his time to literary employments. In 1634 he published in folio, “A Relation of some Years Travels into Africa and the great Asia, especially the territories of the Persian Monarchy, and some | parts of the Oriental Indies, and Isles adjacent.” The edition of 1677 is the fourth, and has several additions. This work was translated by Wiquefort into French, with “An Account of the Revolutions of Siam in 1647,” Paris, 1663, in 4to. All the impressions of Herbert’s hook are in folio, and adorned with cuts. Upon the breaking out of the civil wars, he was induced to side with the parliament; and, by the influence of Philip earl of Pembroke, became not only one of the commissioners of parliament who acompanied the army of sir Thomas Fairfax, but a commissioner also to treat with those of the king’s party for the surrender of the garrison at Oxford. He afterwards attended that earl, especially in Jan. 1646, when he, with other commissioners, was sent from the parliament to the king at Newcastle about peace, and to bring his majesty nearer London. While the king was at Oldenby, the parliament commissioners, pursuant to instructions, addressed themselves to his majesty, and desired him to dismiss such of his servants as were there and had waited on him at Oxford: which his majesty with great reluctance consented to do. He had taken notice in the mean time of Mr. James Harrington, the author of the “Oceana,” and Mr. Thomas Herbert, who had followed the court from Newcastle and hearing a favourable character of them, was willing to receive them as grooms of his bed-chamber with the others that were left him; which the commissioners approving, they were that night admitted. Being thus settled in that honourable office, and in good esteem with his majesty, Herbert continued with him when all the rest of the chamber were removed; even till his majesty was brought to the block. The king, though he found him, says Wood, to be presbyterianly affected, yet withal found him very observant and loving, and therefore entrusted him with many matters of moment. The truth was, he found the king tu be of a very contrary disposition and character from what the malcontents of the day had represented him, and being equally ashamed of them, and of the delusion into which he had himself fallen, he attached himself to the king from that time to the moment of his murder; and during these two years he underwent, night and day, all the difficulties, dangers, and distresses, that his royal master suffered. At the restoration he was made a baronet by Charles II. “for faithfully serving his royal father during the two last years of his life;” | as the letters patent for that purpose expressed. He died at his house in York, March 1, 1681-2. Besides the travels already mentioned, he was the author of other things. He wrote in 1678, “Threnodia Carolina, containing an historical Account of the two last Years of the Life of King Charles I.;” and the occasion of it was this. The parliament having a little before taken into consideration the appointing of 70,000l. for the funeral of that king, and for a monument to be erected over his grave, sir William Dugdale, then garter king of arms, sent to our author, living at York, to know of him, whether the king had ever spoke in his hearing, where his body should be interred. 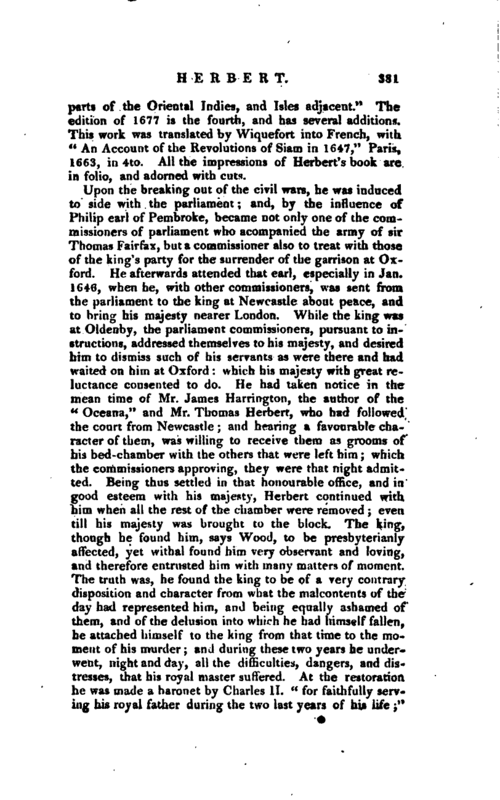 To this sir Thomas Herbert returned a large answer, with many observations concerning his majesty; with which sir William Dugdale was so much pleased, that he desired him by another letter, to write a treatise of the actions and sayings of the king, from his first confinement to his death: which forms the contents of this interesting volume. 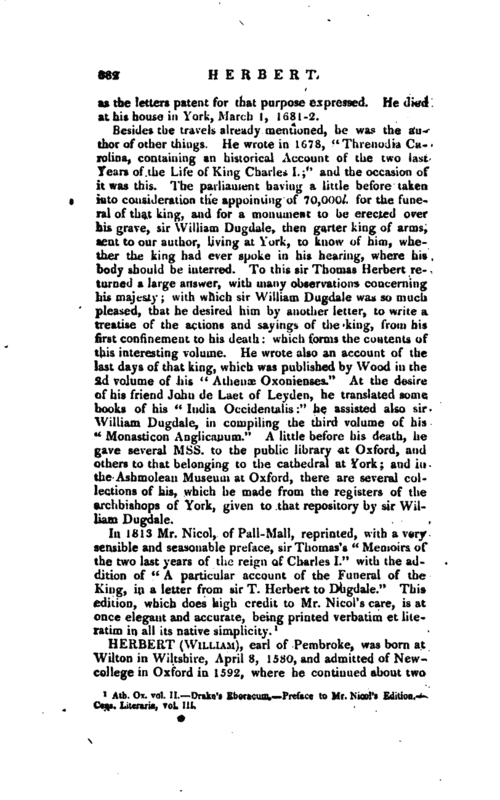 He wrote also an account of the last days of that king, which was published by Wood in the 2d volume of his “Athenae Oxonienses.” At the desire of his friend John de Laet of Leyden, he translated some books of his “India Occidentals;” he assisted also sir William Dugdale, in compiling the third volume of his “Monasticon Anglicanum.” A little before his death, he gave several Mss. to the public library at Oxford, and others to that belonging to the cathedral at York; and in the Ashmolean Museum at Oxford, there are several collections of his, which he made from the registers of the archbishops of York, given to that repository by sir William Dugdale. Ath. Ox. vol. II. Drake’s Eboracum. Preface to Mr. Nicol’s Edition. Cens. Literaria, vol. III.